Once you have Turbo Lister at hand, you can prepare hundreds of eBay listings in advance — and launch them with a single mouse click. Or, if you want to start your auctions at a particular date and time, you can select a scheduled item launching format. 1Click the New button (the one with the sunburst symbol) in the upper-left corner. You can save bunches of time if you write your titles and descriptions in Notepad or Word, at your leisure, before you go into Turbo Lister. You can use your own templates or use the Design View to doll up your text. 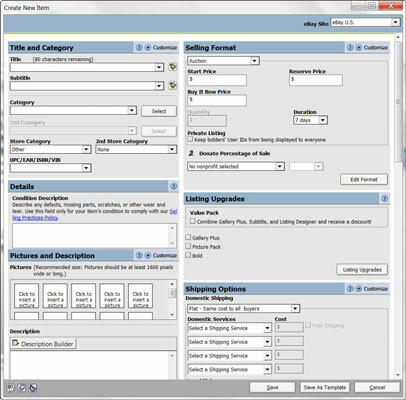 2Select Create New Item from the drop-down menu. A page appears ready for you to enter your title, subtitle, and lots of other information. 3In the Title box, enter the title. If you want to use a subtitle, type that as well. Subtitles are handy for adding selling points that accompany your title in search results. 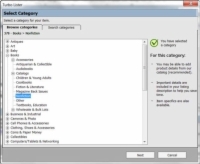 4Select your category from the Category drop-down list and then click Select. You are presented with a screen that lists all eBay categories in a hierarchal format. The main categories are listed with a plus sign next to them. When you find your main category, click the plus sign to see the subcategories displayed. To drop even lower, keep clicking plus signs next to subcategories. You know you’ve hit the bottom of the category ladder when you see only a minus sign. 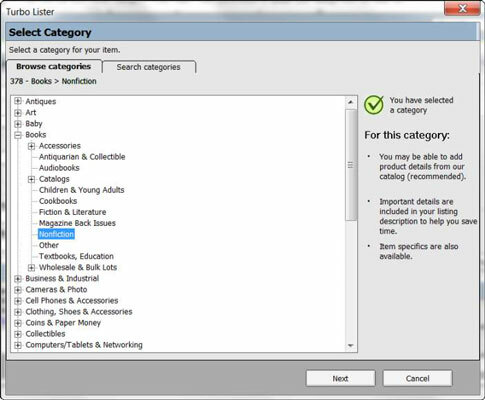 5If you have an eBay Store, select a category for the item in your store from the Store Category drop-down list. This area is automatically populated from your eBay Store when eBay updates your Turbo Lister installation. 6Continue filling in the blanks, uploading pictures, and choosing from lists. When you’re finished, click Save.